Despite efforts by local advocates, the Franklin Hospital was demolished in April 2005. 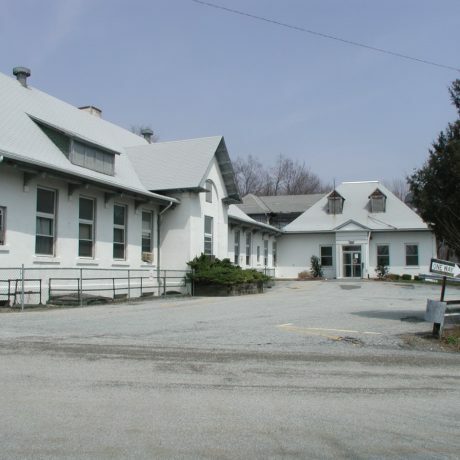 Franklin Hospital, the first hospital in Sussex County, was built in 1908 to treat injured miners employed by the New Jersey Zinc Co. Before its construction, they required an arduous train ride to Paterson or Morristown for treatment. The original stucco-faced, two-story hospital had ten beds, and a staff of one surgeon and three nurses. A 1917 addition increased capacity to thirty beds; in the 1920s the operating room was enlarged, and a laboratory, diathermy unit, and reception room for nurses added. A four-bed maternity ward, added in 1958, completed the physical growth of Franklin Hospital, though it served its community as a full-service facility through the 1980s. In 1994 St. Clare’s Health Systems acquired Franklin Hospital, which it used until late last year to treat patients with emotional problems. The historic building is not currently listed in the state or national registers of historic places, though it appears eligible. It sits on a desirable 16 acre tract at the crest of a hill overlooking the Franklin Pond that has attracted the interest of a developer who wants to replace the hospital with a 192-unit gated community. PNJ feels that this significant reminder of the labor and medical history of Sussex County deserves a better fate.